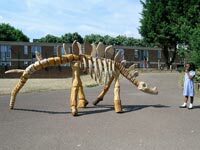 Year five and six pupils were shown how to use wood carving tools then set to work building a life-size dinosaur skeleton for the school grounds. This was an Education Action Zone project. The artist was commissioned by a North Staffordshire Secondary School to work with the students to produce a substantial and permanent entrance piece that would incorporate the students own designs based on memories of their time at the school. The finished sculpture was also to be used as a performance space. A celebration of the life and ideas of Charles Darwin, this project explored the richness and diversity of evolution through the creation of a series of sculptures inspired by creatures from Earth’s distant past. Youth groups and members of the public were given the opportunity to work with the artist at an open worksite in Shrewsbury’s Quarry Park. Two local secondary schools were also closely involved. Students learned the techniques of wood sculpture and developed their own designs for beings that might never have existed – or whose time is yet to come. The culmination of the project was the installation of the sculptures in the Shrewsbury’s Dingle Gardens where they remained on display for over two months. The project was part of Shrewsbury’s Shift Time Festival. It was funded by Shrewsbury and Atcham Borough Council and Awards for All. The artist worked with 70 year fives at a Sefton primary school to produce six permanent pieces for the school grounds. All the year fives were given instruction in the use of wood-carving tools and each helped to realise a series of designs taken from their own drawings.